Metro regularly monitors and reviews feedback from customers and operators as part of the agency’s commitment to build a better transit experience for the St. Louis region. As a result, MetroBus routes and schedules are regularly updated to improve MetroLink connections and MetroBus on-time performance. #41 Lee: Time adjustments to improve schedule adherence on weekdays, Saturdays and Sundays. #49 North Lindbergh: Schedule adjustments to provide better connections at the Ballas Transit Center. #61 Chambers Road: Time adjustments to improve schedule adherence on weekdays, Saturdays and Sundays. #70 Grand: Time adjustments to improve schedule adherence on weekdays, Saturdays and Sundays. Green Line: Route adjustments and schedule adjustments on weekdays, Saturdays and Sunday. 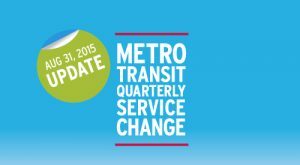 Specific details about the August 31 MetroBus service change updates, including new schedules and maps, can be found on the Service Updates page of the Plan Your Trip section. Metro Customer Service representatives are available from 7:30 a.m. to 4:30 p.m., Monday through Friday, at 314-982-1406 (Missouri) or 618-271-7879 (Illinois). I confirmed firsthand that schedules for these routes are not available at the Metro Store. I also checked and only the 41 and 70 were available at the DeBalviere Garage. The 70 I grabbed was the last copy out on the shelf of the DeBalviere Garage. Also, will schedules be available at the new headquarters as was previously in the lobby of the old headquarters?